Rabbit anti Bovine, Canine, Human, Mouse, Porcine, Rat 4E-BP2. EIF4EBP2 antibody was raised against human PHAS-II synthetic peptide (residues 99-120) was synthesized and the peptide coupled to KLH. PHAS-II, also known as eIF4E-binding protein II (eIF4E-BPII), is a member of a family of proteins which regulate initiation. PHAS-I and -II were found to have overlapping but different patterns of expression in tissues. 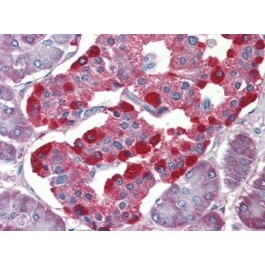 PHAS-II shows the highest expression in liver and kidney where very little PHAS-I is found. The PHAS proteins regulate translation initiation by binding to the inhibitory protein eIF- 4E and blocking translation by preventing access of eIF-4G to the 5' cap of the mRNA. 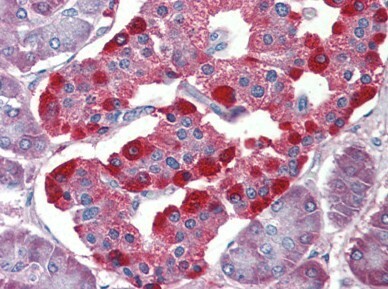 Both PHAS proteins are phosphorylated in response to insulin or growth factors such as EGF, PDGF and IGF-1. Phosphorylation in the appropriate site(s) promotes dissociation of PHAS/eIF-4E complexes which allows eIF-4E to bind eIF-4G(p220), thereby increasing the amount of eIF-4F complex and the rate of translation initiation. Regulation of the two protein differ because PHAS-II, unlike PHAS-I is readily phosphorylated by PKA in vitro. However increasing cAMP in cells promotes dephosphorylation of both PHAS-I and PHAS-II. Pharmacological and genetic evidence indicates that the mTOR/p70S6K pathway is involved in the control of PHAS-I and -II suggesting that these proteins may be mediators of the effects of this pathway on protein synthesis and cell proliferation. Bovine, Canine, Porcine, Mouse and Rat. Detects 17 and 20 kD proteins, corresponding to the apparent molecular mass of PHAS-II and its phosphorylated state on SDS-PAGE immunoblots.